Much like everybody else, I love TorridWear's new umbrella AO! That's the point of this post, aside from yet more photoshop practice! I take my pics at 3200×2400 in a white backdrop (or black, depending on the outfit) inside the Photoshpere. In PhotoShop, I use the magic wand to past them to a white background and remove all the white (or black) in them. After composing the pic, I use as backdrop a gradient or a pattern. After flatten layers, I duplicated the layers, use gaussian blur and overlay of soft light. Another method to lighten the pics is using the exposure in the adjustment layers. I try not to change the original picture. I want people to see the outfits exactly how they are. I will make a tutorial one of these days. 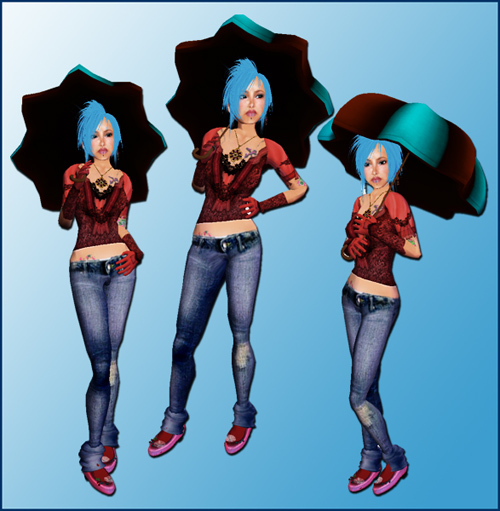 I love Paraplu AO! It's become a staple in my lolli dressing and if I just want to look insanely cute! The stands are perfect. O_o I need to buy the rest of the poses soon. You look fantastic in that skin! sakura: yeah! you looked so cute in it the other day at the animation sim! dove: 8D -- isn't it awesome? yay mia skinz.